Hey, Did you get a chance to see Won’t You Be My Neighbor? I wasn’t a regular of Mr. Rogers, my show was Captain Kangaroo as a little one. But last weekend my friends prompted me to see the documentary on his life, so I went by myself hoping it wouldn’t be a waste of time. Was I surprised! From the jump, my heart burst as I learned Mr. Rogers guiding philosophy. Those sock puppets with corny voices? On the real, they spoke about power, fear, assassination, and the war in Vietnam. I found myself holding back tears to the point I almost gasp out loud. Laaawd, I didn’t expect any of this! Mr. Roger’s casting of actors wasn’t the norm for the time either; gay, women, people of color were a real part of the neighborhood. His underlying theme: you are lovable just the way you are… mistakes, pain, bratty behavior, every part of you is lovable. Mr. Rogers guiding mission made me think about the work you’re doing on campus. Helping students build, explore and find ownership and agency in their lives. 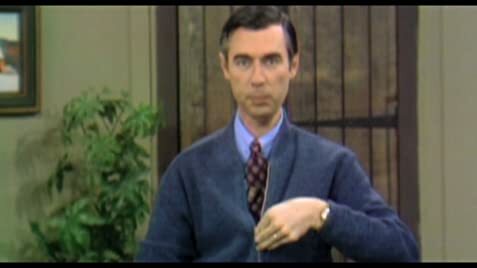 What if you designed a MR. ROGERS STYLE ORIENTATION for Fall 2018!?? My 3-part planning prompts are below. As the program director/team leader create brave space by first sharing a story when you’ve felt powerless, afraid, or unsure. Talk about what’s really going on, especially in challenging times. Its guaranteed people are already feeling these things and ultimately will be grateful that you set the tone. By acknowledging their individual story. Sometimes it’s a simple as listening and/or sharing aspects of one’s story among peers can be incredibly powerful, bonds formed are the building blocks for commitment and positive social change. “The Dot Game” is great way to help others understand how we unconsciously and consciously separate and segregate into groups. Each time I’ve facilitated this exercise, I’m astounded by the revelations from participants.